Biodynamic agriculture has been one of the biggest trends in wine in recent years. Big name winemakers like Château Latour in Bordeaux, Domaine Leflaive in Burgundy, and Tablas Creek in Paso Robles have jumped on the Biodynamic train. Read on to learn more about this farming system that goes “beyond organic”. Biodynaimcs is based on the ideas of Austrian philosopher and esotericist Rudolf Steiner who wrote in the early 20th Century. The principles of biodynamic agriculture are based on the idea that the farm – including its animals, crops, and soils – is a single organism. Biodiversity is emphasized: animals from the farm fertilize the soil, bees kept on the farm pollinate plants, soil is maintained to ensure a rich microbial diversity, composting is used to generate good humus – the organic component of soil that makes it fertile. Biodynamic farmers avoid artificial fertilizers and most chemical pesticides. Instead, farmers try to support a good ecosystem, with cover crops that outcompete weeds, and insects or other animals that are natural predators to pests. Grapes are harvested by hand, and sometimes mules or horses are used instead of tractors for vineyard work. The term “Biodynamic” is a trademark of Demeter International, the organization that certifies farms and their product as biodynamic. Certified wines will have a Demeter logo on their labels. There are many vineyards using biodynamic methods that have not been certified. This may be because they have not been using biodynamic methods for the three-year minimum for certification. Or it may be that the wine grower has decided that the certification process is too costly. Also, some winemakers may decide, while they agree with the basic biodynamic principles, that they don’t want to engage in all of the practices. Winemakers concerned with bad harvests may also want to keep non-biodynamic options available “in reserve”. Root days are when the moon is in the signs of Taurus, Virgo, or Capricorn – the Earth signs in classical astrology. Root days, according to Thun’s system, are the best for planting and harvesting root vegetables such as radishes. Biodynamic winemakers may choose these days for applying compost to vine roots. Leaf days are when the moon is in the signs of Pisces, Cancer, or Scorpio – the Water signs of classical astrology. Crops such as lettuce and cabbage are best planted and harvested on these days. For biodynamic vignerons, these are also good days for canopy management. Flower days correspond to the lunar signs of Gemini, Libra, or Aquarius – the classical Air signs. These are good days, naturally, to plant and harvest flowers. Fruit days correspond to the lunar signs of Aries, Leo, and Sagittarius – the classical Fire” signs. These days for planting and harvesting fruit are important for biodynamic grape growers, of course. Harvesting of grapes will be timed for these days as best as conditions will allow. We’ve also talked to wine salespeople who prefer to do tastings on fruit days – they claim wine shows better! Thun also wrote about effects of the Moon’s “nodes” – the points where the moon crosses the line of the zodiac, as well as its perigee and apogee – the times when the Moon is nearest and furthest from the Earth. Grape growers following the planting calendar will take these cycles into account in deciding when to plant, prune, harvest, and do other vineyard work. Biodynamic agriculture calls for “preparations” – mixtures of minerals, plants, or manure that are added to composts or soils. The preparations are supposed to encourage the “vitality” or “life force” in plants. The preparations contain specific plants, such as yarrow flowers, oak bark, or valerian flowers. These ingredients are composted with other organic material, soil, or crystals. They are then sheathed in animal materials such as bladders, intestines, or skulls. One preparation (the famous Preparation 500) is made from cow manure which is packed into a cow horn. These preparations are buried in the vineyard at certain times of the year, based on the astrological calendar. They are then unburied months later to be applied to the soil. While biodynamic methods are catching on in the wine world, they also have many critics. Techniques such as planting by astrological signs or using preparations to stimulate the life force of plants have no scientific basis. Biodynamics proponents point out that they do no harm, so using them is fine even if you don’t buy the esotericism behind them. Critics also point out that Rudolf Steiner’s strange ideas went beyond lunar cycles and cow horns – he wrote that European people were superior to others, was openly anti-Semitic, and his ideas relating the “purity” of blood and soil gained him followers such as Nazi leader Rudolf Hess. However, these racist ideas are not included in contemporary biodynamic handbooks, and many biodynamic practitioners are not even aware of them. There’s no direct scientific evidence that Biodynamic wines are of better quality than ones made from conventionally grown grapes. However, Biodynamic methods call for a grape grower to have awareness of the vineyard. Vines need to be pro-actively checked for problems so that the proper compost or sprays can be used. A biodynamic vigneron is in the vineyard regularly. 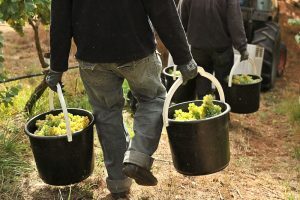 This may lead to healthier grapes and a good sense of when to do work in the vineyard, up to and including harvesting. Many consumers feel that this kind of awareness does lead to better wines. The forbidding of pesticides and artificial fertilizers is also reassuring to many wine drinkers – both for ecological and health reasons.